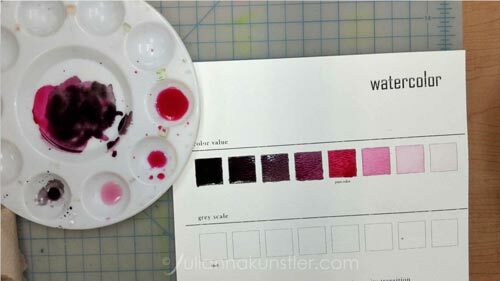 Watercolors basics. Practice washes and techniques. 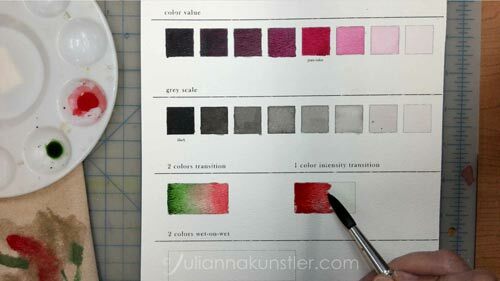 Every paint medium is made of a pigment and a binder. 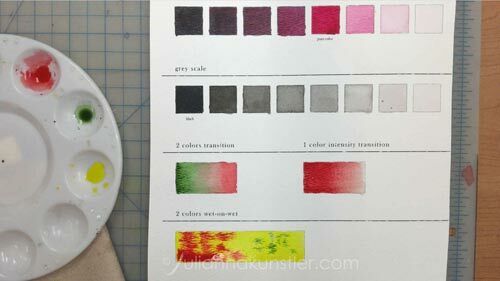 Watercolor = pigment + gum arabic. 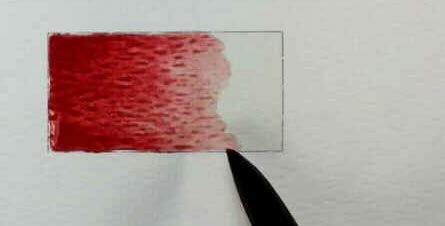 Acrylic paint = pigment + acrylic medium. 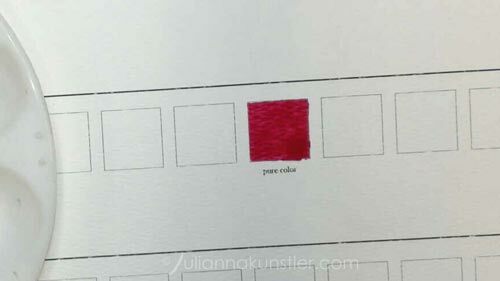 The binder holds the pigment to the surface on which you are painting. 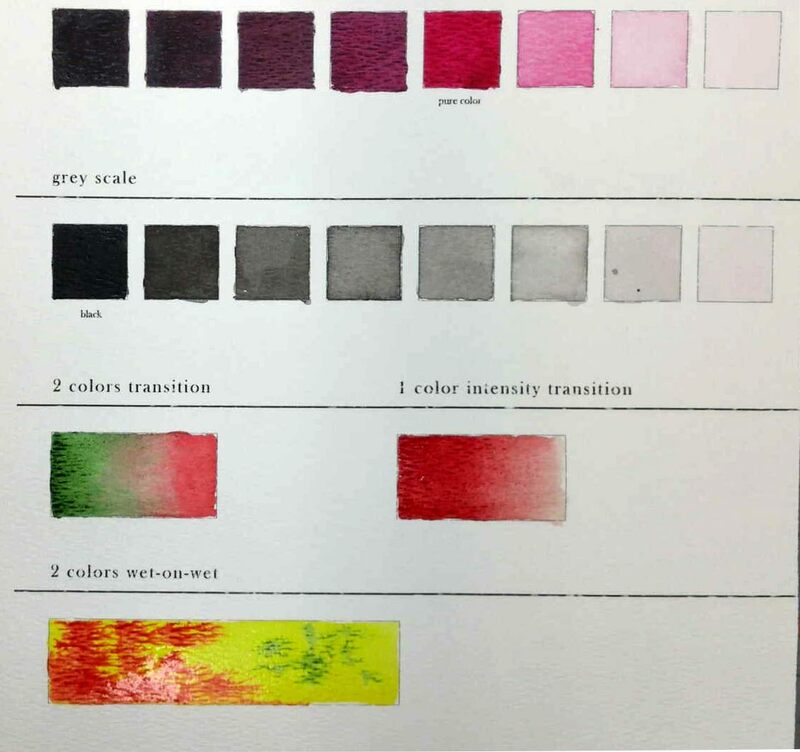 This is why you cannot paint with just pigment and water; when it dries, the pigment will simply blow away because there is nothing adhering it to the support. 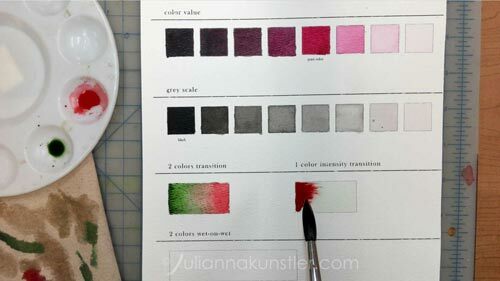 Watercolor paint dries to a lighter value. 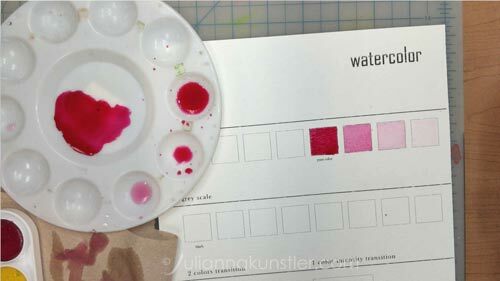 The most important characteristic of watercolor paint is it transparency. 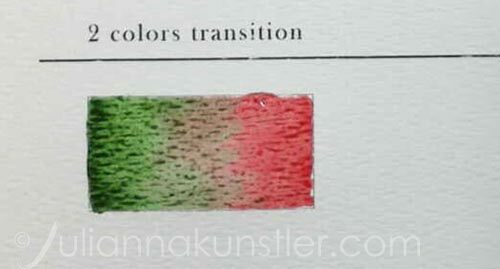 It allows you to layer the washes like stacking layers of colored glass. Preserving this transparency makes the painting look fresh and true to the medium. 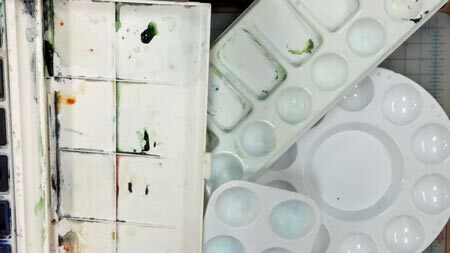 Watercolor brushes have the ability to hold water (and paint) by having a fatter belly and thinner hair. 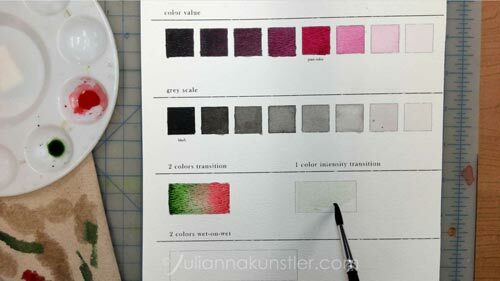 Watercolor paper comes in different types (textured, smooth) and forms (loose paper, blocks, albums). They all have two things in common - they are heavy papers (90lb - 400lb) and they absorb water. Palettes also come in all shapes and materials. They should have small "cups" for mixing washes. 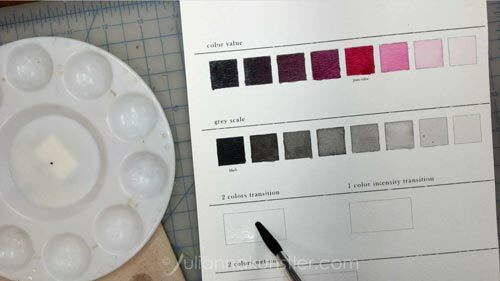 do not use paper for a palette - it will make colors dull and opaque. 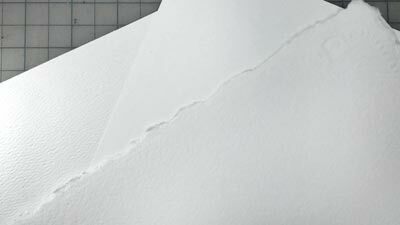 The dry brush painting stroke is not really dry - it creates a range of broken shapes and edges. The first exercise is a Color Value scale. 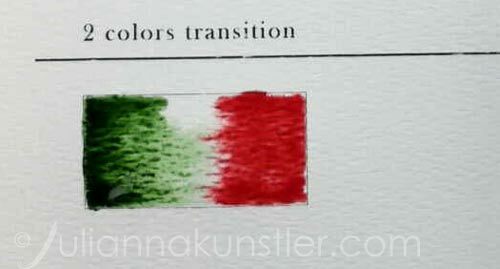 Watercolors use the whiteness of a paper as a WHITE color base. 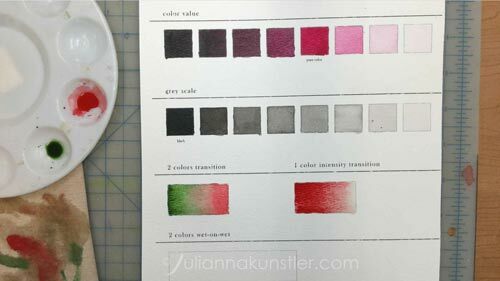 Do not mix your color with a white paint (even if you have it in your set) - it will "kill" the color's transparency. 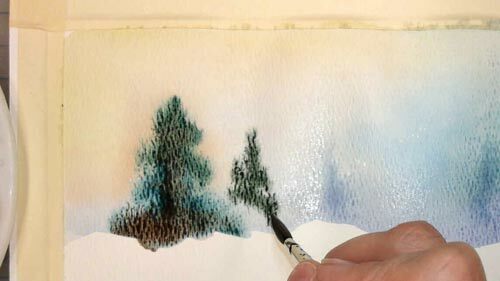 Use water to lighten colors and blank areas for whites. Create an intense wash of a color of your choice. 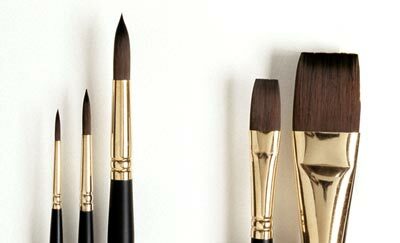 Make sure you have a blotting paper next to you to remove excess paint from the brush. Fill in the square. Distribute the wash evenly inside the square. If one of the parts has too much of the wash - lift it with a damp brush. Mix a part of the wash with some water. Fill in the next square. 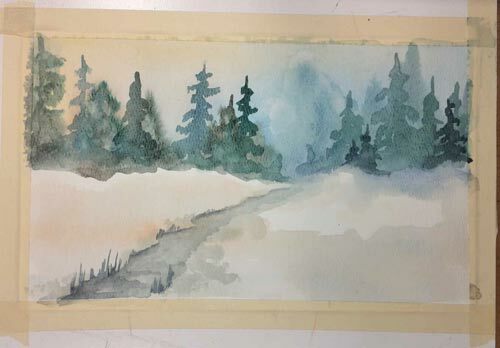 Continue adding more water to lighten the value. 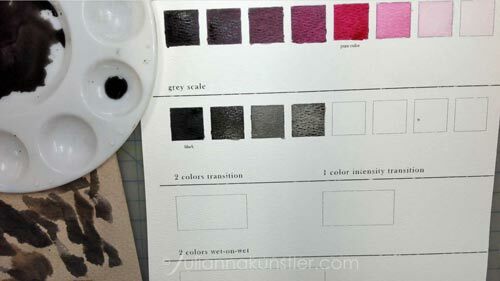 Mix your color wash with a small amount of BLACK wash. 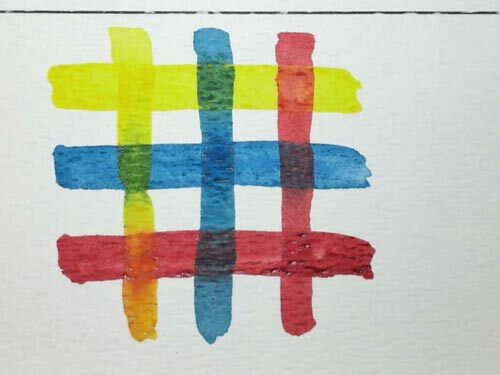 Paint a square to the left of your color wash.
Continue adding more black wash to each square on the left. Now let the washes dry. Fill in the first square. This should be a vary intense wash - it should be BLACK. Add some water to the wash and fill in the next square. Continue lightening the values for the rest of the squares. Let the Value scale dry. Start with applying water inside the outline. Make the paper damp, not flooded. If you applied too much water - lift some up with a dry brush or let it dry a little. Paint 1/3 of the area with one color and the last 1/3 with another color. Leave a gap in between. Make sure that the washes are more intense by the two sides. 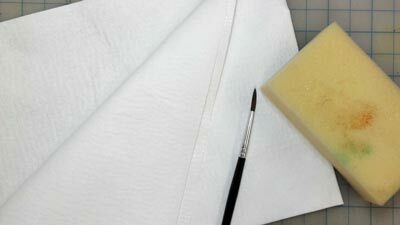 Use a clean damp brush and mix the washes in the center. Apply an intense wash on the left side of the area. Then clean and dry the brush. 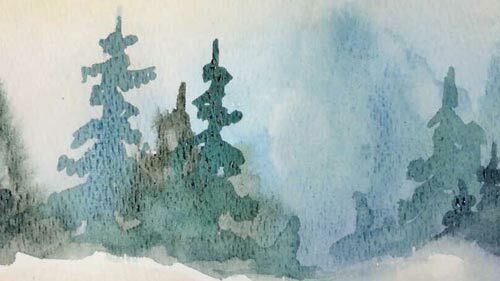 With a slightly damp brush move the color wash to the right. Clean the brush again and dry it. Continue cleaning the brush as you proceed with the wash. The right side of the painted area should be the lightest value. This part is just for fun. 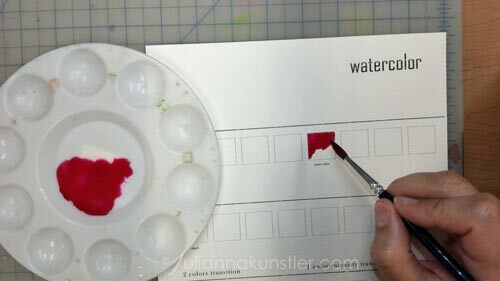 Cover the area with a color wash.
Drip another color onto the wet area or draw random shapes. 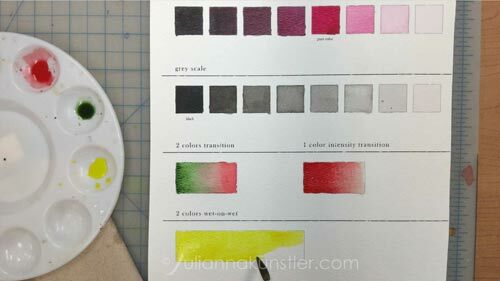 See how the paint bleeds and mixes with the first color? 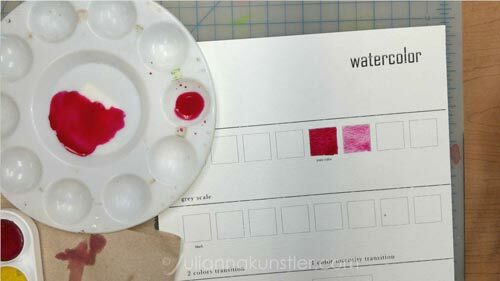 If the first wash is still too wet (flooded) you almost do not have any control of the shapes that you are painting. If the surface is just damp - you can more or less control it. This is something that you are going to do in your next exercise.